The current generation has seen the publication of several well received books espousing the benefits and power of music. Books like This is Your Brain on Music by Daniel Levitann and Music, Language, and the Brain by Aniruddh D. Patel offer post-doctoral science research coupled with musical knowledge and skill. And while over two decades old, Anthony Storr’s Music and the Mind continues to draw attention for its examination of music’s impact on cognition. The supposed art/science divide does not exist inside these volumes, but each field explores the other in some degree. In our current STEM (Science, Tech, Engineering, Math) academic climate, this group of authors easily finds space to insert “A” for Art, thereby upgrading curriculum to STEAM. So why do school boards and governments seek to cut Arts in times of budgetary restraint when international research confirms the wide-ranging cognitive, emotional, physical and social benefits of music instruction? Manitoba’s Education Ministry and Ontario’s Literacy and Numeracy Secretariat explain that musical activities strengthen phonological awareness, building word recognition and decoding skills. And preschool and elementary programs combining musical activities with literacy instruction find improved student scores in reading and writing tasks. The Toronto District School Board continues to fund school music programming but even distribution of instruction is difficult in the continent’s fourth largest school board. 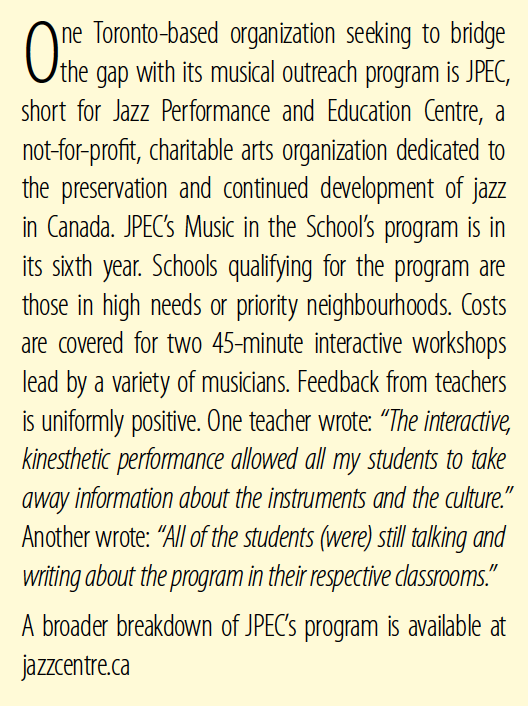 Advocacy group “People for Education” documented the erosion of school music programs in Ontario. As of 2013, one third of students did not have the opportunity to engage with an artist. Of vital importance in access to music education are community centres and libraries for their workshop and visiting musician opportunities. Provincial and municipal arts organizations often provide support for such centres to host guest artists to lead groups in instrument making and learning songs linked to history and dates of significance. A 2010 study prepared for the Coalition for Music Education in Canada detailed the importance of music programming in schools. 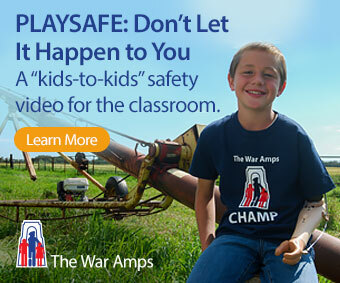 Over 1000 Canadian schools took part in the study. Titled “A Delicate Balance,” the 120 page document elaborated upon the challenges for a successful music program, and the benefits of having one. Opening comments underlined the importance of having a qualified teacher, a supportive administration and parent community, dedicated space for instruction, stability of staffing in coming years and, of course, a predictable budget. Removal of even one element can begin a destabilizing slide. Other equally important programs like Health and Physical Education can come into conflict because of space and budget. Sadly, in one school, the implementation of full-time kindergarten displaced a full-time primary Orff music teacher from an instructional space. * These kinds of exchanges don’t do anyone any good. Of those primary-to-secondary schools responding to the nation-wide survey however, there was clear perception of the potential benefits of music education. With rates ranging from 60% to 75%, greater outcomes were demonstrated in the following: improved self-discipline and self-esteem among students; building community and collaboration improved the atmosphere for learning; increased achievement in other academic areas. At the opposite end, an extreme example of the impact of budget cuts derives from New Brunswick where reductions were so severe that lack of music education caused music-focused summer camps to close. Such an event is its own negative multiplier. Not only is there diminishment of programming and its benefits within schools, but also removed are the prospects of further music education outside of school. Art and Science explain each other’s depths, as physicist/saxophonist/author Stephon Alexander explores in his 2016 book The Jazz of Physics: The Secret Link Between Music and the Structure of the Universe. During a short but dense seven minute TED Talk, Dr. Alexander referenced the structure of jazz using the great John Coltrane’s composition “Giant Steps,” drawing connections between quantum physics and a Coltrane-created diagram that Alexander identified as a “musical-mathematical realization of quantum gravity.” Alexander discovered the diagram in a book by the late Yusef Lateef, a well-respected composer and teacher. Alexander saw the connection to his research trying to unify quantum gravity with Einstein’s Theory of Relativity. Music became the key that unlocked scientific understanding, gaining him new insight and a return to research in collaboration with colleagues. Stephon Alexander’s personal journey encompassing both scientific and musical worlds is a story in itself, a lesson in how music reaches deep into our minds, preparing us for that which we have yet to discover. Or, maybe music just makes it more fun to go to school and be with others, whatever one’s age, benefiting us now and in the future. Help students create instruments and then play them: e.g., drums out of plastic containers, horns out of paper towel cardboard rolls, or any toy instrument they have at home. Don’t forget voices as an instrument. Investigate organizations that have programs for children: everything from Tafelmusik Baroque Orchestra to the National Ballet have special programs. Some bring musicians to you at no cost to the school. Check out your local community centre. Maybe together you can initiate a program for children’s music. And remember, it’s not just fun. It’s brain food. * The Orff method of teaching is recognized as a method of teaching children music in a level they can understand. Founder, Carl Orff said it like this: Experience first, then intellectualize. Wade Potts taught for 35 years with the Toronto District School Board, and is now retired.